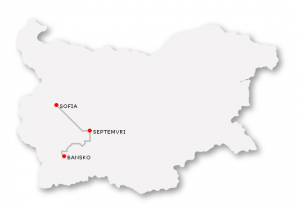 Getting from Sofia to Bansko including bus, train, private transfer, car rental, taxi and shared transfers are in this comprehensive and up-to date guide. Not only do I list the timetables, and all relevant links, but I offer my views on how to choose the best way for you to travel that most suits your needs. But first I examine in detail the options on how to get from Sofia Airport to Sofia Bus Station, if you think the best option for you is to take the bus. 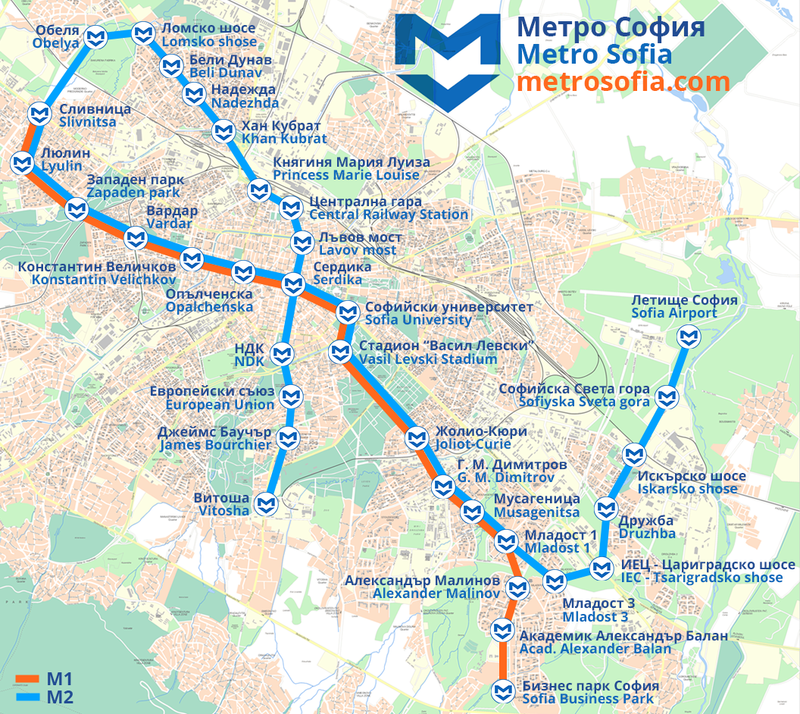 This section is also useful for if you’re staying in Sofia and getting around there. The best way to the bus station is to take the metro (link to metrosofia.com). It will cost you 1.60 leva (0.82 EUR). There is a metro station at the airport, but only on terminal 2. If you have a large check-in bag you will need to buy another ticket for the bag too. Sofia Airport Metro station of T2 is right next to the building of Terminal 2 of the airport. The metro trains operate from 5am to midnight. see metrosofia.com for detailed timetable. Your single ride ticket price is 1.60 levs (0.82 EUR) and is valid for the entire metro network so you can use the same ticket for transfer to M1 line. Tickets can be purchased from the cashier desks in the metro station or from ticket machines. Sofia Airport provides free-of-charge transportation services between Terminal 1 and Terminal 2 at every 30 minutes between 07:00 hrs. and 19:00 hrs. The stop locations of the shuttle bus in front of both terminals are designated by signage and pavement markings. Between 19:00 hrs. and 07:00 hrs. there is free of charge transportation between Terminal 1 and Terminal 2 that can be requested at the Information Desk or at a telephone. Take the metro to Central Railway station. The bus station is next to the Railway station. It is better to change the lines at Serdica Station to save time — rather than stay on the metro and go round the loop to get to the station. 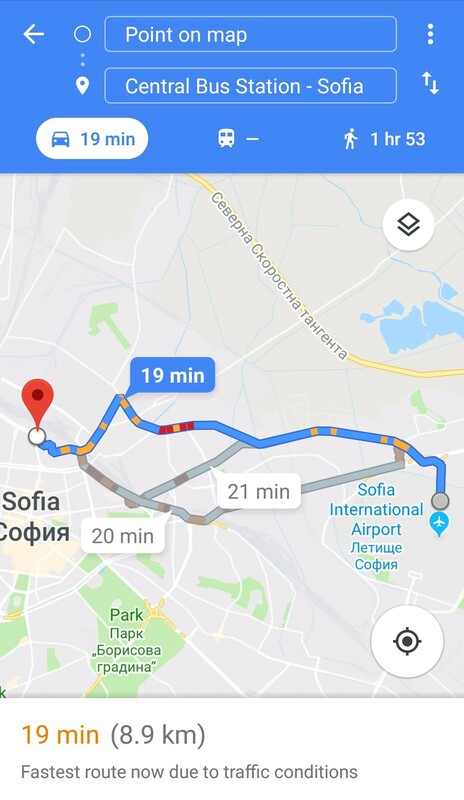 Buses that run between Sofia Airport terminals are: 84, and 184, 384 – 184 and 384 require a 2 minute walk to the stop. Go to moovit app for details. UBER: There is no Uber service in Sofia. It was banned. Use the official OK Supertrans taxis only. Be warned there are many fake OK taxis so to be sure grab a ticket from the OK taxi kiosk in the airport. 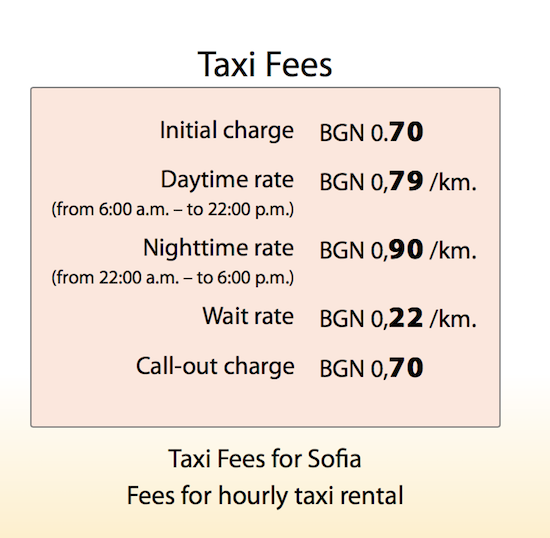 When in Sofia use Yellow Taxi or TaxiMe apps — they work like Uber — but you can pay your driver in cash (leva). It will take you about 20 minutes from Sofia airport to the Bus station and cost about 12 leva, depending on time. OK Supertrans: 9732121 OK Supertrans are the only authorised taxi company to work at Sofia airport. But there are many fake and scam OK taxis. It’s hard to spot the difference but the best way is to check the phone number on the side is exactly 9732121. Panda Taxi 0890 98 21 21. CB Taxi 91263: Just a little cheaper than the rest but still fine. 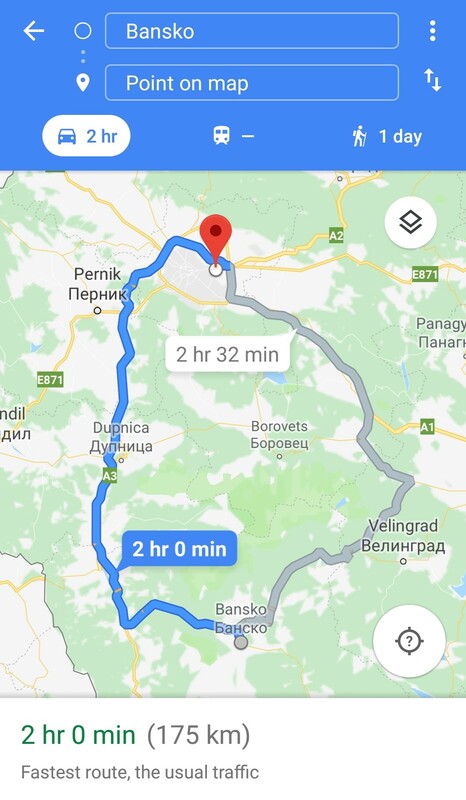 if you’re staying in Sofia and fancy driving yourself around. 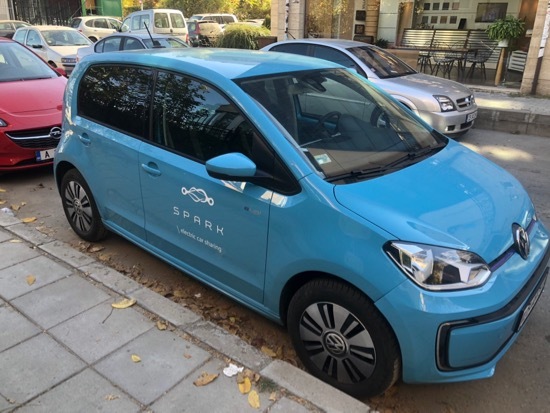 Spark is super cool option of hiring a all eclectic city car. No parking fees and you’re helping pollution. It will cost you also 1.60leva. It’s always 1.60 leva for a single journey. There is no direct bus to the Bus Station. You can download the free moovit app to see all the options. But you’ll have to change bus one or two times. Not a good option if you’ve got bags with you. Ovcha Kupel Bus Station is the other bus station in Sofia with buses to Bansko. I don’t recommend it because it is further from the airport and there is no direct public transport there. If you want a cheap way it is a good choice. It will cost you only 15.30 leva. The buses from Bansko to The Central Bus Station to depart every day. The average time travelling, by bus, is about 3.5 hours. But there is a chance of having to change buses on one of the bus stations en route. 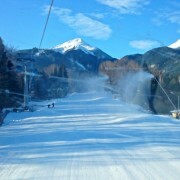 Bansko is not the last station for the bus. Its Gotse Delchev. So pay attention and make sure you get off the bus at Bansko Bus Station. From Bansko Bus station you can take a taxi, there is often one waiting around at popular times. Note that much of the ski accommodation is near the gondola lift traffic lights. Expect a 30 minute uphill walk so check carefully exactly where your staying in Bansko. It is a different experience travelling by bus in Bulgaria. It takes a lot more time — but it is the cheapest way for solo travellers. I’ve done it in the past and it is okay if time is not a priority. If the time to take a bus is not for you, then you should probably skip the second option below — taking the train, which takes much longer. You can probably scroll down to number 3 and check out private transfers where you won’t be bothered by changes or stops. 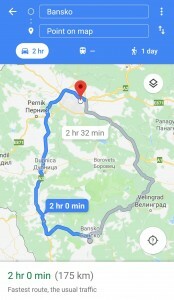 You’ll be in Bansko in around 2 hours travelling in comfort. 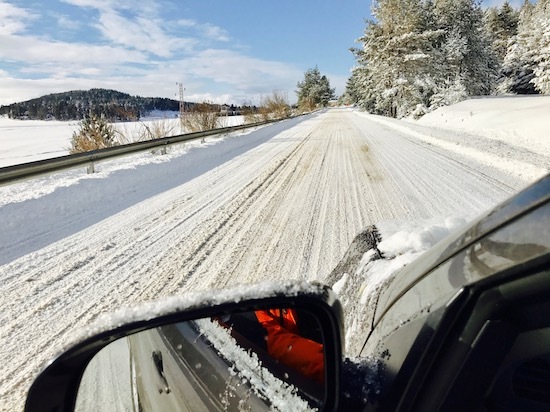 Throughout the journey you will see breathtaking views, but you are going to spend about at least 8 hours travelling to Bansko. You’ll also be switching trains. It depends on the type of person you are but, for many people, it has been described as an overly long and exhausting adventure. For others an unforgettable and pleasurable experience. Bring your own food and drink. There are trains at: 06:38, 10:28, 13:16 and 22:45. A private transfer is the most popular way. You are on a holiday and you want to spend it properly. You don’t want to think about anything like waiting for others to arrive on another flight (in the case of shared transfers) or be tired by driving yourself. Private transfers are for the return journey; 170 km each way. One way, half price. There are of course other transfer providers, but booking in the app helps us keep you up to date on what’s going on, the weather , the app, the cams and much more. A shared transfer is also an option but my experience when we ran them for a few years was poor. I stopped offering them because shared transfers mix loud groups of lads with families with young children. The two don’t mix. Children dislike waiting around, they get grumpy and start to create family stress. It’s simply not worth it. And the saving is not significant if there are two or more persons taking a transfer together. However you will see in the terms and conditions of shared transfers is that you may have to wait for other flights to arrive and share the ride with those people. It’s inconvenient to be waiting around an hour or two at Sofia airport, often requiring you to wait at the other terminal than the one you arrived at. This could be your only way if you haven’t booked a transfer. Expect to pay a (high) price. If you are booking four hours away still book in the Bansko App but call the number you receive on confirmation to confirm you really do require the transfer. 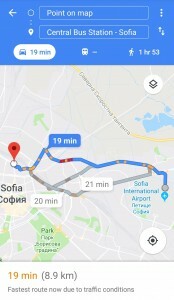 If you are travelling alone and are on a tight budget and you’re not getting in late to Sofia then taking a bus is a good option. 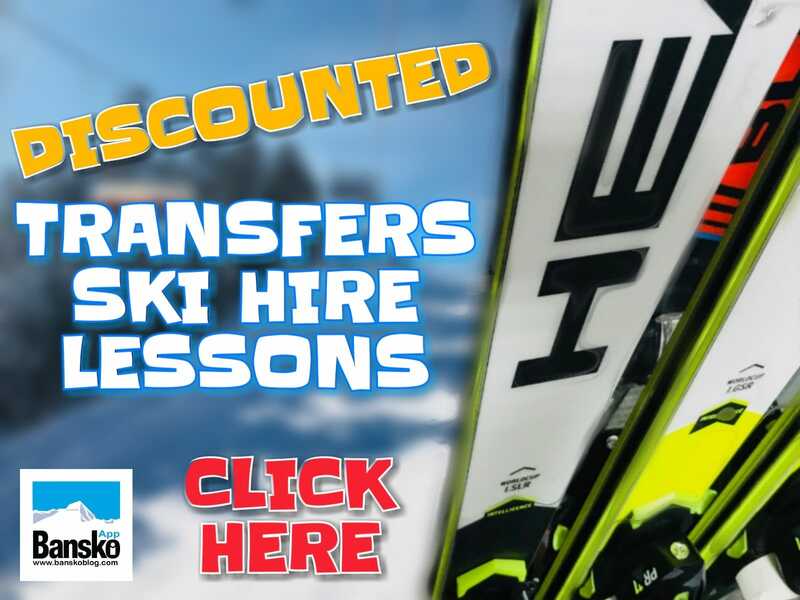 So it’s no surprise that, if there are two persons or more, then most travellers to Bansko decide to book a private transfer not just because it’s great value. It’s more enjoyable, more practical and more time efficient than the other options. DISCLAIMER: Whilst This article was researched and the information contained it was verified with the assistance of Gabriella Balleva, I cannot take responsibility for the accuracy of the information in this article. Times change and prices change. 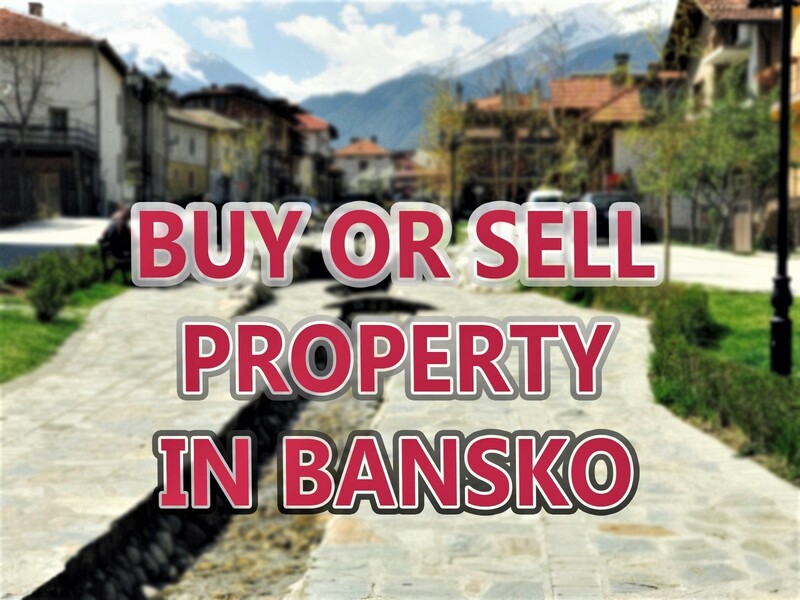 Since 2008 my mission along with the Bansko Blog team has to be inform and educate and live up to our mission to provide “all you need to know about Bansko”. 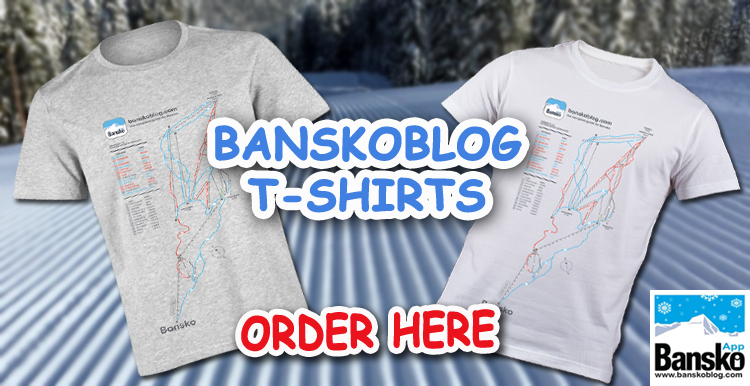 So if you found this article useful then subscribe to the Bansko Blog newsletter for news, special offers, offers and discount codes. Unsubscribe anytime.